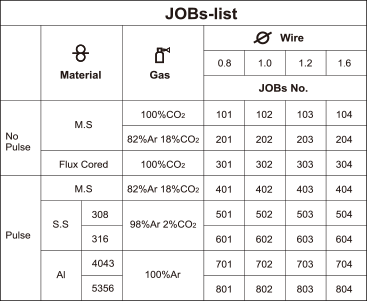 The Job-lists display is easily and intuitively controlled through its graphical user interface.We assembled the perfect welding curve in every Job-No. for highly efficient multi-process welding of carbon steels and stainless steel and aluminum alloys. Operation is easier than ever before. 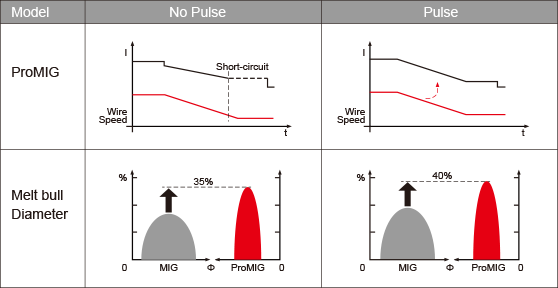 Compared with the traditional DoublePulse, High Speed Double Pulse process can increase the welding speed by about 25%. Welding quality is comparable to TIG process. No need to swing, You can easily get a cosmetically pleasing weld seam, with significantly lower and more controller heat input into the workpiece. It results in much lower distortion and less rework, very suitable for welding the thin Aluminum or S.S sheets. By High-Speed Double Pulse process, the heat input of arc is alternating, effectively reducing the heat input of base metal. It reduces the occurrence of welding defects such as crack. • Initial Short Control reduces the amperage immediately after the wire shorts which stabilizes the short, minimizing the spatter caused by wire chattering. • Neck Control detects the moment droplet detachment begins to neck then quickly reduces the amperage before short releases. 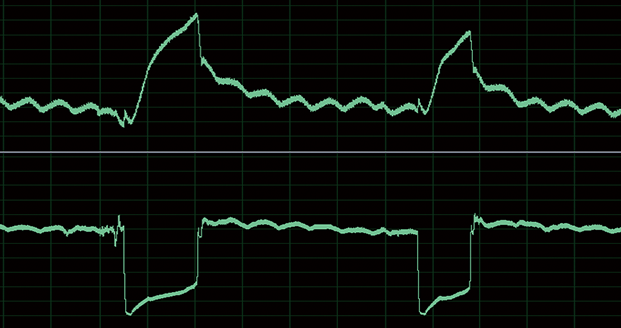 Releasing the short at a lower amperage reduces fuse effect energy. 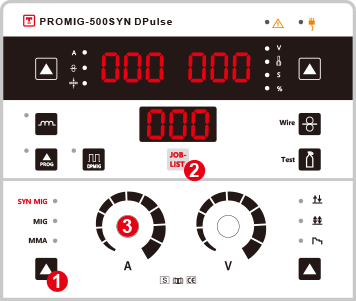 • Stable Transfer Control increased amperage directly after the short release. 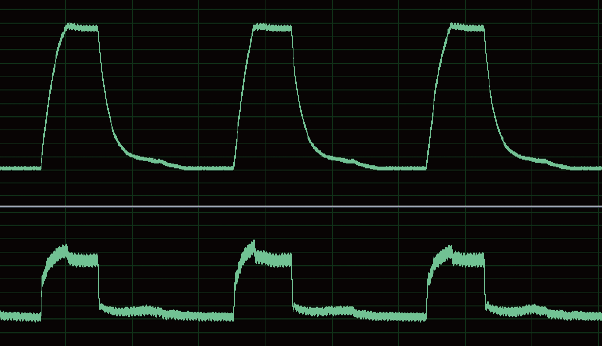 Adding amperage quickly burns the wire to prevent secondary shorting. The faster burn off creates the droplet faster and reduces total arc time which increases the frequency and provides a crisp and clean arc. For CO₂ process that suppresses weld pool vibration preventing secondary shorting. Best for high quality and high speed welding of medium and thick plates. In the matter of welding speed, everything starts with the wire. 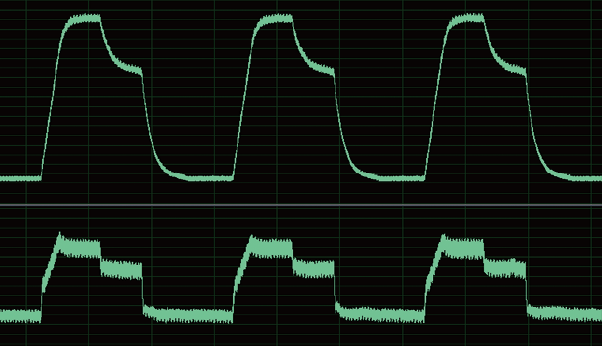 each pulse must melt the largest amount of material. 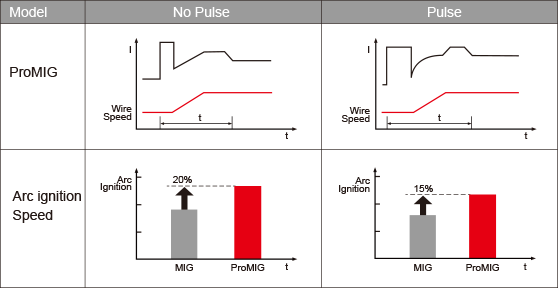 while only on droplet per pulse is transferred for the standard pulse process, high Speed-pulse prcoess achieves an almost constantly flowing metal transfer into the workpiece. ·Higher productivity due to faster we;ding speeds, up to 30% quicker. The HSP optimised for fillet welds (FW) completed using PF welding (in vertical up position); can also be used to great benefit in other weld positions. For Topwell ProMIG Series, HSP is approx 70 % faster, an enormous progress for everyone welding a vertical seam. A whole new level! No need to swing! No undercuts or other defects! The speed of PF welding by HSP is twice that of the traditional pulse welding. We control the arc energy by welding waveform, so the success rate of arc ignition can be improved and quickly establish a molten pool. Adjustable time delay between turning off the arc and the wire feed to prevent wire sticking to the puddle. 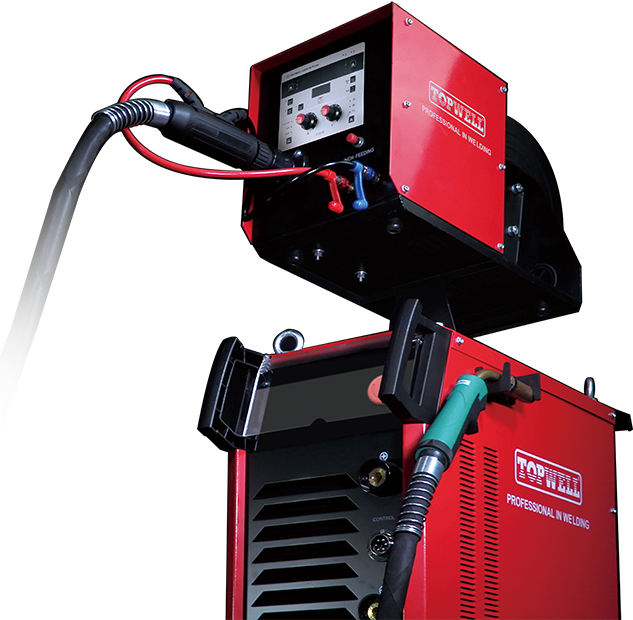 Dynamic control allows the welder, for the first time, to variably adjust a pulse welding machine to a wide range of jobs and welding positions as well as to his personal preferences. The welder can use a controller to directly access the arc characteristic and change it from soft to hard.